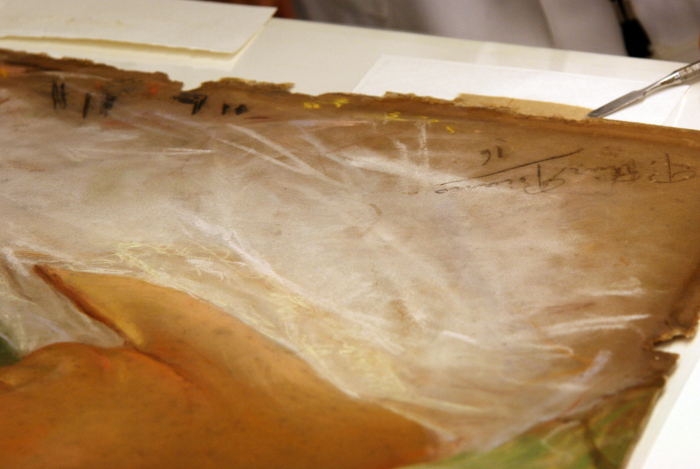 On February 28th the Museu Picasso organised a seminar entitled The pastel technique: specificities of its conservation and restoration. This was a technical conference with the pastel procedure as its main focus, in which we discussed different systems applied to the conservation and restoration of this artistic procedure and the latest alternative proposals were reviewed of its handling, framing and presentation in rooms. The event was a success in terms of participation and an occasion for restorers from the whole country to meet up. We were also able to count on the presence of our colleagues from the Musée National Picasso, Paris. After a brief introduction of the Collection of the museum given by Anna Vélez, a member of the Preventive Conservation and Restoration Department of the museum, we presented our lines of action and the conservation policy on works produced using fragile techniques such as charcoal or pastel. 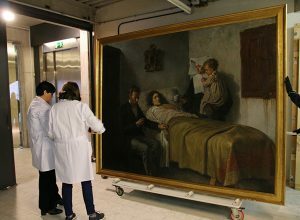 The conference opened with the presentation of the restoration process of an emblematic piece of our collection, the Portrait of the Artist’s Mother produced in 1896 by a young Picasso who had recently arrived in Barcelona. This has been one of the latest interventions carried out by the department of prevention conservation and restoration of the museum and which on this occasion counted on the collaboration of two technicians in graphic documents, Carme Bello and Angels Borrell from Estudio B2 of Barcelona. The vision and experience of the different specialists involved allowed us to deal with all the aspects related to the support and the supported element, the colour applied to the pastel. 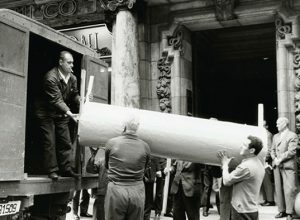 A secondary cardboard support, stuck on during a previous restoration, had provoked structural tension in the paper, which had become apparent over the years in a progressive way until the work had ended up becoming seriously deformed. After the new intervention process had been carried out, these distorting elements that affected the stability and impeded the correct perception of the understanding of the understanding of the distorted work were removed. Also during this restoration process, a drawing was discovered on the back that in these moments is undergoing a process of documentation. A special exhibition allows the visitors to see, in a temporary and exceptional way, until April 7ht, both the front and back of this work. Cécile Gombaud, conservator of works in paper and currently collaborator of the Rijksmuseum of Amsterdam, presented various practical case studies of interventions carried out in pastels of diverse formats, as well as his personal experience in the use of systems for fixing the colour based on sturgeon glue. Florence Herrenschmidt, consultant in preventive conservation and specialist in the conservation of graphic documents, gave a brilliant historical overview of the first attempts in preventive conservation at the beginning of the 20th century focused mainly on the casuistry of loans and transport of pastel works. 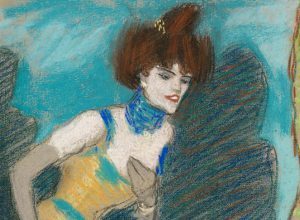 From her perspective as restorer of the Antoine Lécuyer Museum (Saint-Quentin, France), a small museum with an important collection of pastels, she explained the specific problems of maintaining a coherent conservation policy with limited means. Finally, the conference was brought to a close by the Swiss Olivier Masson, conservator of works on paper. 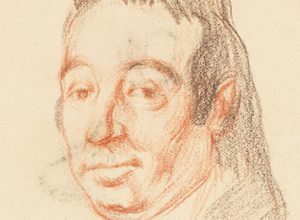 His research in preventive conservation has allowed him to develop an ingenious procedure for assembling pastels. Some internal cardboard structures provide stability to the work, protecting it from climatic variations and isolating it from harmful materials. In this way it is possible to maintain the original frames and glass and respect the unity of the work. Tengo una pintura antigua, el motivo es mujer con niño, pintada con oleo sobre lienzo y sin firmar, tamaño 61.7 x 50.2 adquirida en el barrio gótico de Barcelona. Buenos días Ricardo. 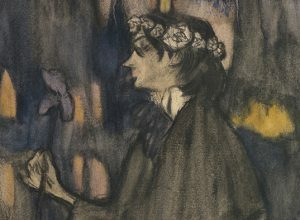 Desde el museo no certificamos obra de Picasso. 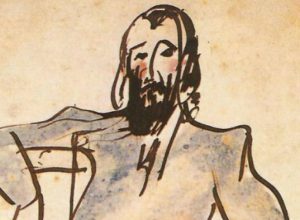 Para saber si la obra que adquiriste es de Picasso tendrías que dirigirte a la Administración Picasso de París. Muchas gracias.